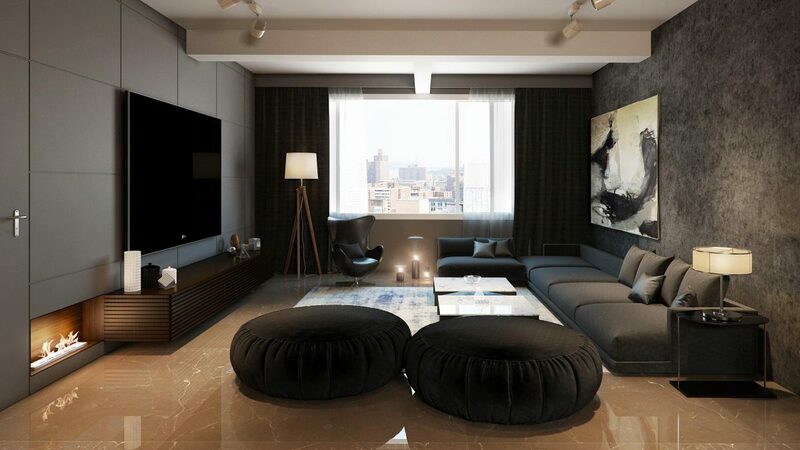 Your apartment is a reflection of your style statement and the living room is surely the first impression. The living room is an area of public domain compared to all other spaces in a residence. It is the heart of entertaining and relaxation. Bring in a sense of privacy to the living room by planning for a cut of lobby which forms a transient space and cuts off vision to an outsider. The key to a well planed living room is to keep the space as minimal and uncluttered. Design for ample of seating a brilliant way to do it is to have combination of a formal sofa seating and informal seating in the form of poofs, floor cushions so that the space feels visually larger and you can plan for more seating. A slightly unconventional approach would be to do away with the television in the living room. Dining is a separate function in itself and must be planed in a manner such that it ideally is a separate zone which flows into living room and still has its own space. A contemporary statement brings in an international appeal to the space. Have one or two design element as the highlights and keep the rest of the story board muted. The highlight wall could be your tv wall or the sofa back wall depending on what meets the eye the most on entering the space. A simple but a strong way of bringing of working around the highlight wall is to use a range of designer wall papers. Another interesting way to work around it is to create wall textures for an absolute minimal stark appeal clad the wall with large format wall tiles. Let the tv unit along this wall for the gadgets be as sleek as possible to make the space look seamless or explore the idea of designing the audiovisual rack tucked into a corner and control the gadgets on automation using radio frequency based systems. This design idea makes the space look very minimal. No space is complete without the right lighting, suspended light from the ceiling above the corner table or the center table make great visual interest to the entire space. Bring down the curtains straight from the ceiling the length and the flow of the fabric adds a touch of scale and grandeur. Styling the space with the right furnishing and accessories is of paramount importance. If you choose to bring in prints do it through any one element preferably the curtains and throw cushions and limit to one element so its not over done. The floor should be monolithic and continuous to make the space look visually larger to enhance the effect you could also continue the same floor material on to a terrace attached to the living room. Throw in a rug below the center table this dresses the floor through textures and colours. Living room best would be a neutral pallet, a dark palette is also quickly becoming an international flavour and trend, if u want colours u can add it through cushions or curtains depending on the mood you would like to build. For a fusion suggest to have a contemporary canvas and bring the fusion through a few prominent elements like a wall paper and a decorative light fixture.